We’re making our own sausage for the first time this year. Last time we had the slaughterhouse do it. We were not impressed. We weren’t impressed with the smoked meat either, but they have a new smokehouse, and we have to take one step at a time. In the spirit of one step at a time, we bought a bunch of different seasoning mixes from The Sausage Source in Hillsboro. So far we’ve made hot and sweet Italian sausage, hot and sweet breakfast sausage and bratwurst. We still have spices for kielbasa, hot dogs and liverwurst. 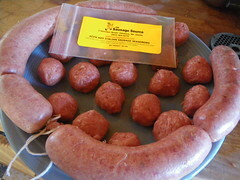 We also have spices for andouille, hot and sweet, but that’s smoked. We like our Alton Brown home-brew smoker, but, well, he lives in Atlanta. 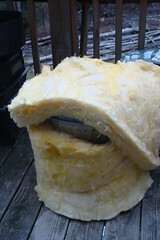 We got it to work at 23 degrees (-5C) by wrapping it in insulation. Today the temperature fell all day and was at 5 (-15C) when the sausage would have been ready to smoke. Add in a howling wind, and that poor little hot plate was just outclassed. We may give it a try later in the week when it’s supposed to be a bit warmer. If it doesn’t work, we’ll freeze the ground pork and make the sausage when we can smoke it. 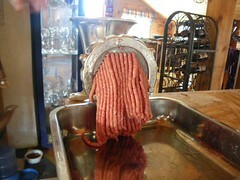 We bought a Porkaert meat grinder, also from The Sausage Source, last year after the KitchenAid meat grinder attachment failed miserably. We’ve been using that, and it does a fine job for the second grind, but there are some issues with using it to stuff the casings. It’s very easy to rip the casing as you put it on. The actual stuffing really needs three hands. It’s very slow compared to grinding, and you have stuff the last three links worth by hand with meat you pull out of the grinder, which is even slower than using the grinder. Finally, it’s tin coated steel, not stainless. It’s safe enough as long as you’re careful, but I question whether health department, here or in the EU, is going to allow it to be used in a commercial kitchen. I mention the EU because it comes from the Czech Republic. There are way too many negatives in the paragraph above. It’s built like a battleship–the way American stuff was made before 1960. As a grinder, which is what it is, it rocks. And because the Czech Republic uses Korunas rather than Euros, it’s barely more expensive than the one fourth as good Chinese alternative. What actually sent us to the Sausage Source was buying a semi-pro vacuum sealer, after the home model we bought 5 years ago turned out to be a piece of junk. It cost a pretty penny, and the bags for it are in the 40-50 cent range depending on size, but it works. 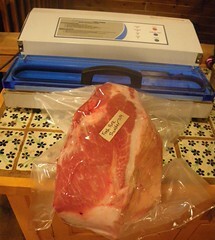 Vacuum sealing keeps far longer than butcher paper. Because we have Ginny as well as a gilt, and Ginny weighed over 500 pounds and each gilt was about 270, it’s about twice the amount of pork that we usually get at slaughtertime. It took us about six hours to seal all the meat we have. The only time we had any trouble at all was when a particularly sharp bone sticking out would pierce the bag as the vacuum started sucking. We learned to position the meat so that was less likely to happen pretty quickly. I learned the hard way not to vacuum seal uncooked meat balls. Today we pre-froze the breakfast sausage patties (two hours on the balcony) and that worked well. I think I’ve figured out how to freeze the rest of the sausage. I’ve no clue what we do when Lisa picks up the smoked meat on Monday. Time to Freecycle and Craigslist for another freezer. Sausage update: 1. We should have sampled immediately. 2. Our ground pork is too lean. We need to add fat. 3. The mixes are good but weak. Next batch I’ll try four pounds of meat to the spices supposedly for five. We made the kielbasa successfully too. It came out with fuller flavor than the others, and homemade sauerkraut (traded from someone else) covered the too dry issue. The rest of the sausage we plan to make is cooked, so we froze the rest of the pork to use another day. Since tomorrow is back to work day, the pigs got the remaining fruit. The last of the leaf lard is rendering and the rest of the fat is frozen.